I need about a yard of fabric with pictures of leopards on it for a tote. Not the black one that is really a panther, but the yellow spotted one. Have looked all over and have only found one that even came at all close (colors all wrong and very expensive). If anyone knows where I can buy it please let me know. My friends last name is Leopard and that is why I need it. Plan on using a jungle print to go with it. Have already checked the top name on line sites, but have probably missed a bunch of them. Any help will be greatly appreciated. Why not just a leopard print? That might be easier to find. Did you try fabric search? I find a lot of harder to find fabric there. Good luck. Could you possibly find a picture and get it printed onto fabric and use as a panel piece? 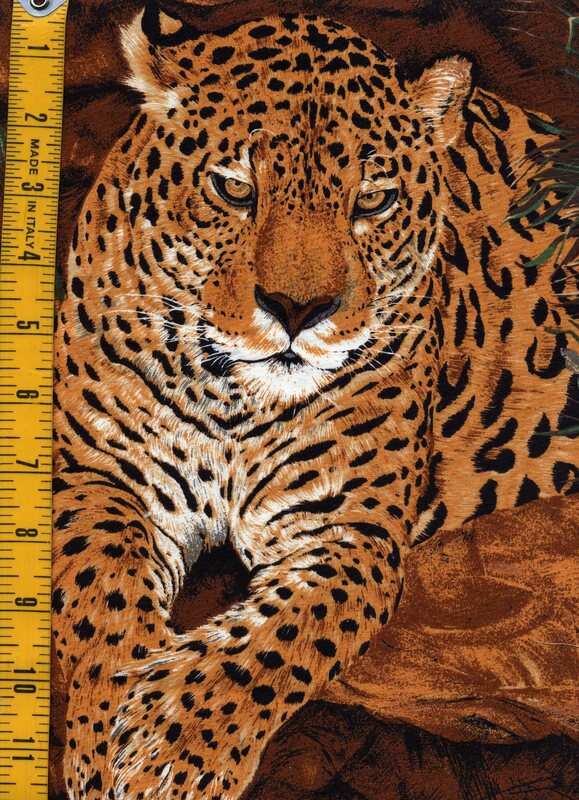 Just wondered if you have checked ebay for cushion panels for leopards, might be an idea. Last edited by feline fanatic; 08-19-2013 at 07:31 AM. I have a small piece that is quite a few years old that has flowers with the leopards. The only info on the selvedge is Fashion Avenue by Fabri-Quilt,Inc. I know I purchased it at a fire sale from a liquidation place up here in BC. I've searched and can't see anything similar under that name though. I have three pillow panels with a coordinating dark green leaf print. Send a PM if interested. Sorry - I haven't figured out how to do pictures yet. I didn't have enough patience to look at more than 20 page on e-bay to find a match. I just love these panels. Must look into getting them myself, postage to the UK permitting!